I think these cooking and resting times are right. I just start my rice before I do anything else and leave it to cook by itself. If it burns —what, sometimes it burns! Just turn off the heat and let it rest covered, the steam will soften the burned bottom and you can scrape it right up. I make brown rice to eat with curried vegetable stew and veganly beans, but it's also good to have on hand to eat for pre-workout carbs with a little bit of salsa or sriracha for flavor. 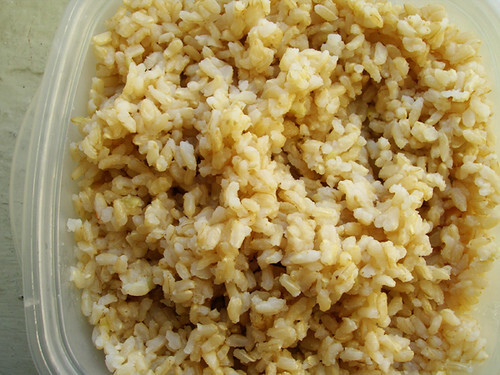 Combine rice and water in a saucepan and cover with a lid. Bring to a boil over high heat, then turn heat to very low and let simmer for twenty minutes. Turn off heat and let rest for another ten minutes.